This Sunday evening the 2016 NRL season comes to an end with the Cronulla Sharks facing off against the Melbourne Storm at ANZ Stadium. Having played five Grand Finals in eleven years the Storm have arguably the best two players over the past decade in two of the most significant positions on the footy field in Cameron Smith and Cooper Cronk. These two seasoned campaigners bring big-game experience and composure that produces results in grand finals. The Sharks haven't played a Grand Final since 1997, however James Maloney, Michael Ennis, Chris Heighington, Matt Prior, Luke Lewis and Ben Barba have all appeared in grand finals with previous clubs. The Sharks have been slow out of the blocks in recent times and can't afford to give up an early lead. If the Storm were to find an early lead of say 8 points or more the Sharks will find it very difficult to pull back that margin. If the Storm get out to a two try lead they'll revert to the style of footy they know best in those situations and bore the Sharks to death, which could easily frustrate the Sharks and lead to unforced errors, especially from their inexperienced backs. Ben Barba and James Maloney hold the key to the Sharks' success. We know the Sharks' forwards will show up early, and if Barba and Maloney can make good use of their impact, strap yourselves in - we'll be in for a contest to eclipse the nail-biting finale to the 2015 NRL season. 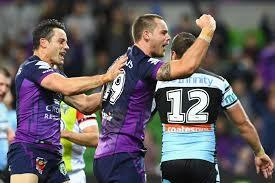 The Storm will be led around the park by Cameron Smith and Cooper Cronk. They will most likely pick up three or four repeat sets, take two points when it's on offer and score two or three tries. The question is, will Maloney and Barba step up in attack to match them? Storm -1.5 @ $2 with Ladbrokes.com.au and first scoring play ; Penalty Goal Storm $4 with Betstar.com.au.